Chop onions, separating white portion from green. Place white portion in small saucepan; reserve green portion. Add sauce mix and milk to saucepan; beat with wire whisk to combine. Add butter; cook over medium heat until mixture comes to a boil, stirring constantly. Reduce heat to low; simmer 1 minute. Cover; refrigerate at least 2 hours or until thickened and cool. Meanwhile, heat oven to 400°F. Place pork tenderloins in shallow roasting pan; rub surfaces with garlic salt and pepper. Bake at 25 to 30 minutes or until no longer pink in center and meat thermometer inserted in center registers 160°F. Cool 20 minutes or until cool enough to handle and slice. Reduce oven temperature to 375°F. Place bread slices on ungreased cookie sheet. Bake 7 to 9 minutes or until crisp. Cool 10 minutes or until completely cooled. To serve, stir reserved green portion of onions into sauce. Cut pork into 32 slices. Place 1 slice pork on each toasted bread slice, folding slice if necessary. Top each with 1 teaspoon sauce; reserve remainder for another use. Top each with 1/8 teaspoon crushed pink peppercorns. 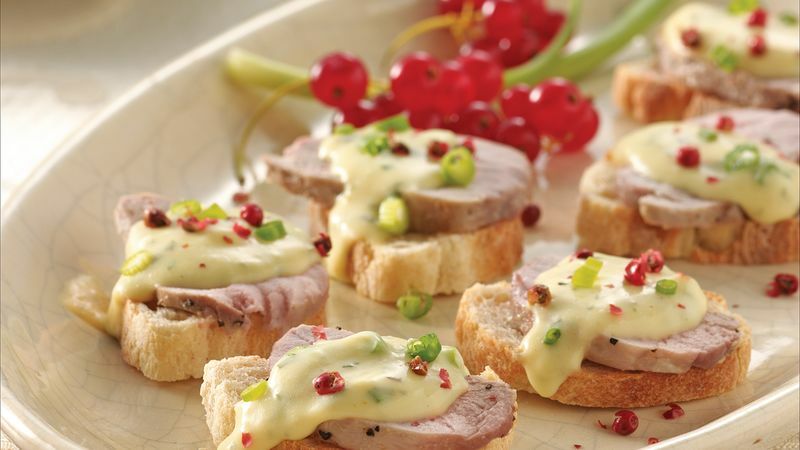 To make sure no one goes home hungry, you may want to have some tiny pork sandwiches on hand to please youngsters who may not care for the béarnaise sauce and the pink peppercorns.